Kentmere Anticlockwise Loop, Staveley - Cumbrian Trail Guides - Mountain Bike Cumbria - beautiful trails and information from throughout the Lake District and beyond! Parking is available on the right hand side of the road to Kentmere just past Barley Bridge. Start by following the road towards Kentmere. Cross the "River Kent" at "Scroggs Bridge" and about 250 metres further on turn right onto a steep uphill signposted to "Elf Howe". At the top the bridleway continues through the right hand gate. The bridleway follows a walled track until you reach a gate by a small stone footbridge. Cross the footbridge, turn left and follow the track up the hill until you reach the tarmac road, "Hall Lane" at the top. Turn left and follow the road to the stables at "Park House". Continue along the dirt track through three gates to arrive at Grid Ref: NY 468018 where the map shows "FBs". Take the gate on your left and follow the (indistinct) track on grass for about 250 metres until you arrive at a cross-roads made by a path coming from a gate on your left. Turn right at this cross-roads and follow the bridleway north towards "Nuttera Beck" and "Long Houses". At first the track is downhill through bracken. At the bottom cross a stream at a narrow gate then head slightly uphill across open grassland towards a gate in a corner. Shortly after this gate the track goes left into an excellent downhill to "Long Houses" and the road to Kentmere. Turn right onto the road and continue towards Kentmere. 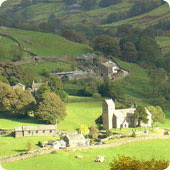 At the top of the hill by the church take the track to the left signposted to "Kentmere Hall" and "Ings". The bridleway goes through a gate on the left just before "Kentmere Hall" and can be seen running diagonally uphill just below a mast with a white box attached. Follow the bridleway for 2 Km, mostly uphill (! ), to Grid Ref: NY 443028 where a "Sheepfold" is marked on the map. Pass through the gate and turn left, do not cross the stream. The first techno challenge here is to try and get up the steep bank as the track heads away from the stream. This is a bit easier now that erosion protection has been put at the foot of the slope but most people still manage to fall off. At the top of the bank follow the bridleway towards the south-east. Drop down through a boggy area, cross a wide stony stream at the bottom (another techno challenge this - or use the stepping stones) and climb up the slope to reach a narrow gate. From here its all downhill; at first on an undulating grass slope, more excellent opportunities for falling off, and then, after crossing the "Ford" at Grid Ref: NY 449019, on a steep stony track. At "Ullthwaite Bridge" take the gate on the right just before the bridge and follow the track up through "Browfoot" and onto the tarmac road at "Browfoot Lane". Follow the road back to the start position at Barley Bridge. This trail has been viewed 49635 times!